If you remember from my post on Friday, I had 2 goals for this race: 1) Run without my Garmin 2) Have fun. Saturday night, Gia sent me a race strategy which was huge since I had absolutely no idea how I wanted to run this race other than well, just to run. I think my lack of any kind of strategy is what lead to me not doing nearly as well as I'd hoped to at the Cowtown Half back in February and struggling through the last few miles. Gia's plan was perfect and lead me to execute a race strategy to near perfection crossing the finish line feeling strong, confident and happy. Before getting into the nitty gritty of the race, I'll say that I didn't PR. I know it was because of a fear starting around Mile 6 of going out too strong and dying around Mile 10. This is one thing that I really need to learn to work on...and I think that if I had had my Garmin, I might have had a bit better of an idea of whether I could have picked up the pace or not but I'm so happy I ran without my watch and am considering doing the same for my next Half...we'll see. The Race started at 8am and I got to the Start around 7:45 and made my way to the corrals with Andrea, our friend Kelly and The Pilot. My stomach wasn't feeling too hot which worried me because, if you've been a follower of this blog for any amount of time, you know that I don't have the best luck with my stomach at races. My plan for the first 5k was to just run steady. Gia suggested I not try to pass anyone and just try to run in a straight line. I did just that, which surprisingly felt good...I feel like I normally waste so much energy trying to weave through people in the first few miles that it was refreshing to just run and not worry about trying to fight through a crowd. I do think that this was easier said than is normally done since the crowd was thin from the start. I saw The Pilot just before Mile 1 at which point my stomach started to ease up. I started getting worried about how I would feel over the course of the race since I missed the mile marker for Miles 2 and 3 and felt like I was running an endless mile before I saw the 5k marker and started to pick up the pace. I didn't know my pace at the time but I'm slightly disappointed in my first 3 miles as this pace is much slower than I'm capable of but learning to figure out the feel of a pace without relying so heavily on a watch is just something I'm going to have to learn. My plan for the middle 10k of the race was to just pick it up mile by mile...to go hard but not all out. As I said earlier, I was worried about going a little bit too hard which probably kept me from PRing but I was feeling strong and I liked the feeling of picking up the pace at each mile...I found myself looking forward to each mile marker so I could push myself just a little bit more. By the time I hit Mile 9, I started picking people off...I felt great and I took my 2nd gel of the day to give me that extra kick to the Finish. At this point, my quads were starting to feel a little uncomfortable but I wasn't in pain and I knew I could manage the discomfort to the finish. The stretch from Miles 4-9 were absolutely desolate. It was eerily quiet for a race. There were absolutely no spectators and only bands, which was disappointing. I could have used the pick me up a few times since I didn't bring music of my own, but I feel like this only made me concentrate more on picking up the pace each mile. Mile 9 was the turn around as we went up over a bridge and then ran back down the other side of the Schuylkill down to the Finish. My plan for the last 5k was to go out full throttle, leaving nothing behind. Honestly, I still think I had a little bit left in the tank because again, I was worried about going all out and then having to crawl across the Finish but I definitely pushed myself and made a goal of picking people off. 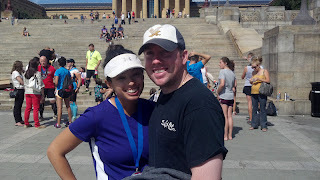 I remember from the Philly Marathon/Half-Marathon (which follows the same route to the Finish) that the Finish Line comes out of nowhere...you don't hear it before you see it like most other races I've run...it was nice to be prepared for that and not feel like I was nowhere near the Finish. Once I hit Mile 12, I pushed hard. I almost never go out at an all out spring until I see the final Mile Marker but this time, I knew I wanted to sprint that last Mile as hard as I could and that's just what I did. It took 3 races but I finally got a picture with Rocky after one of them! Looking back on the whole experience, I definitely think I'll run without a watch again. I see two sides to this: If I had run with my watch, I easily could have PRd based on how great I felt...at the same time, I wonder if I would've held myself back knowing that the target Half pace I wanted to hit was one that I haven't trained for. I think that I'd really like to train for the Half distance come spring time and try to PR without my watch. So yes, I will definitely race technology-free again. Having a race strategy mapped out for me was also an enormous help and I really don't think I would have done as well as I did without it. It took 8 Half-Marys but The Pilot finally made it down to one! 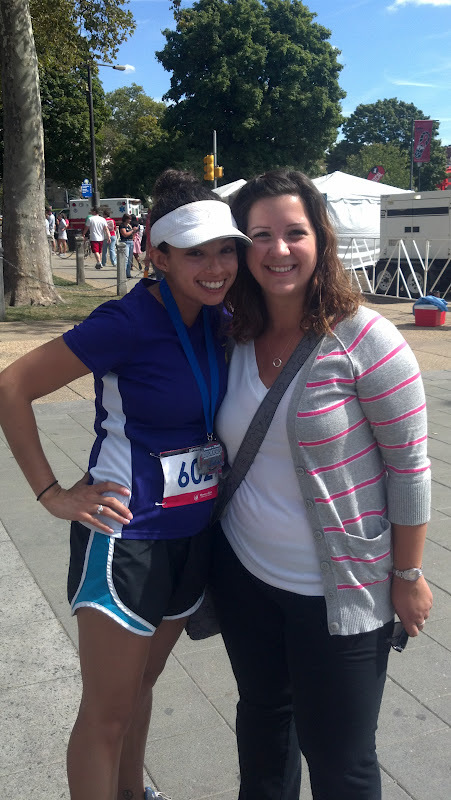 The best part of the whole weekend though was when Holly, whose blog I've been reading and following for almost 2 years now, took a page out of my book and Oops-ed her way to Jersey this weekend and then decided to pop on down to Philly and met me at the Finish Line! She's even more awesome in person than she is on her blog (and that's saying a lot!) and it meant the world that she came down for all of 10 minutes to say hello! So that's that...I ran 'naked' and I had fun doing it. I missed having my Garmin for the first few miles but then I really enjoyed just running by feel. I think it was a great learning experience and I will absolutely try it again! It was a great weekend for racing based on what my Twitter feed tells me so Congrats to everyone who ran the North Face Endurance Challenge, the BAA Half-Marathon, the Philly Rock & Roll Half or any other race! Have a fantastic start to the week everyone! YAY!!!! Congrats on running such an awesome race!! 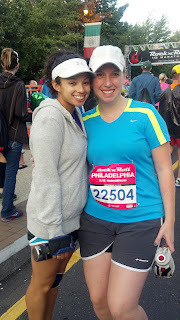 You are my inspiration for running AND for traveling ;) And I am SOOOO happy that we finally got to meet!!! You are so sweet and I have a feeling that we're becoming real-life friends now, too :) Can't wait to start planning to run a half next year with ya!! Now that's a pretty awesome race shirt you're wearing!!!! 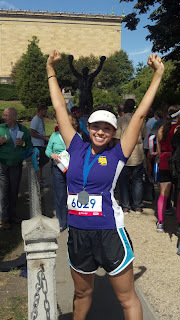 Congratulations on running a Garmin-free race and ending on a happy note! Congrats! Negative /even splits are the best way to run! With time you will get better at feeling paces so you will know exactly how hard you can push yourself without looking at a watch. That is the best way anyways because it should be based on how you feel not some arbitrary number on a watch. AWESOME. so glad to hear how happy you are with this! marathon has got nothing on you. You are literally my running hero!!! Ahh! Congrats! I love the strategy! Nice work, lady!